Click the photo to read the review from Phindie.com. The Hour of All Things a new solo play by OBIE Award-winning playwright and Philadelphia native, Caridad Svich, will be presented as the featured guest performance in the The Philadelphia Women’s Theatre Festival (PWTF). The Hour of All Things, directed by Zac Kline, is a dynamic solo tour-de-force featuring Broadway actress Blair Baker as Nic, an ordinary young woman who seeks to find her voice and effectuate change in a world increasingly beset by violence and tragedy. It is a play that is written directly to our times that speak to a post-Occupy, fully globalized world and is equally politically grounded as it is poetically charged. It is a piece about looking out into the world and knowing that each and every one of us can, and should, make a difference. It’s a play for right now. Maybe some questions don't have answers. In Dead Author Songs, two couples come together and fall apart over a dynamic few months. Love and loss push at the limits of what it means to embrace someone, while still embracing yourself. 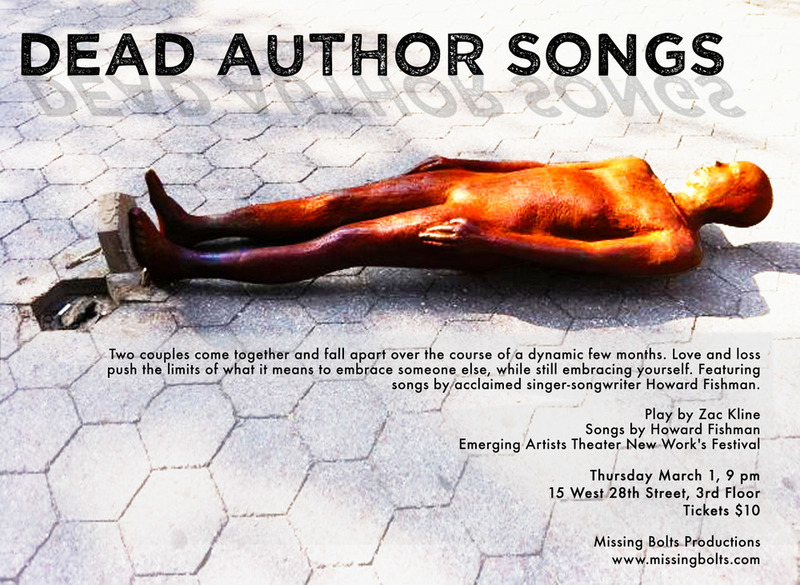 Dead Author Songs was first presented as part of Emerging Artists Theatre New Work Now Series. A one-woman show with a modern sensibility, Big Star California follows a young woman, Ryan, on a road trip from Los Angeles to Seattle as she tries to define the important relationships in her life and let go of what is holding her back to fully embrace the future. Big Star California was developed at Emerging Artists Theatre New Work Now Series. It then had a sold out run at the Live Arts/Philly Fringe Festival. Inspired by The Great Gatsby, the films of John Cassavetes and The Iceman Cometh, Summit Avenue is part play, part rock concert, part party. Summit Avenue follows a group of friends on a hot summer afternoon as they have a wild party. When an unexpected and uninvited friend shows up, things become more interesting than expected. Rock music. Booze. Hipsters. Fights and more! Summit Avenue was first presented at the Figment Festival on Governor’s Island, voted Best Arts Festival of 2011 by the Village Voice. Taking place over a long winter weekend, Messed Up Here Tonight is a dramatic and entertaining study of the relationships between twenty-somethings Ellie, Will, and James as they attempt to put complicated pasts behind them and move forward with their lives. When an emotionally unstable James shows up unannounced one night, he interrupts Will and Ellie's weekend plans and as truths and tensions unfold, these troubled three friends must learn to deal with parental expectations, depression, and a varied assortment of personal issues, past and present. In conjunction with Renovations Theatre Company, Messed Up Here Tonight played a sold out, site specific run.